Poor Acer. Nothing about the Aspire E-15 (model number E5-573-516D) that Acer sent us is wrong. Literally nothing at all. It's a perfectly good machine. The problem? It's almost exactly the same machine as the Toshiba C55-C we took a look at—only marginally worse. And it costs fifty dollars more. It's the America's Got Talent to Toshiba's American Idol. It's the Ken to Toshiba's Ryu. It's the Mr. Pibb to Toshiba's Dr Pepper—and don't you dare tell me you "enjoy Mr. Pibb more." Okay, if you are one of those weirdos that prefers Mr. Pibb maybe you're also someone who wants to spend more money to get less laptop. In that case, read on. 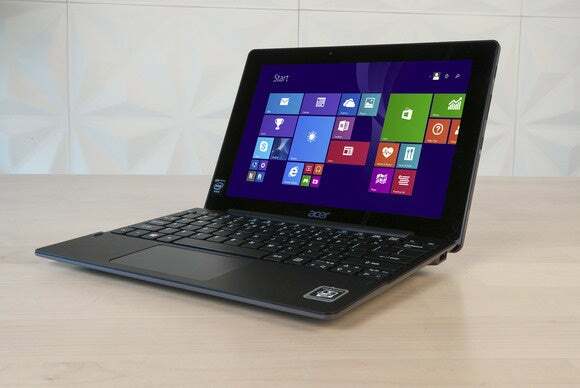 Like the C55-C, the Acer Aspire E-15 is a 15.6-inch laptop with a 1366x768 resolution screen. That 1366x768 resolution is standard at this $500 price point—literally every single laptop in this round-up used the same. If there's place where Acer edges out Toshiba though, it's the screen. The viewing angles are a bit wider, the colors a bit more vivid, the backlight a bit brighter. Not a lot, mind you, but it's enough to be worth mentioning. Oh, and it's built better. The lid on the Toshiba C55-C feels like you might rip it right off the hinges or bend it in half if you're not careful. The E-15 is sturdier and can take some punishment, though the screen still flexes more than I'd like. Aside from that, the E-15 casing is pretty damn similar to the Toshiba, down to the same faux-brushed metal look on the lid. The E-15 does opt for a two-tone design though—black on the outside, grey on the inside. 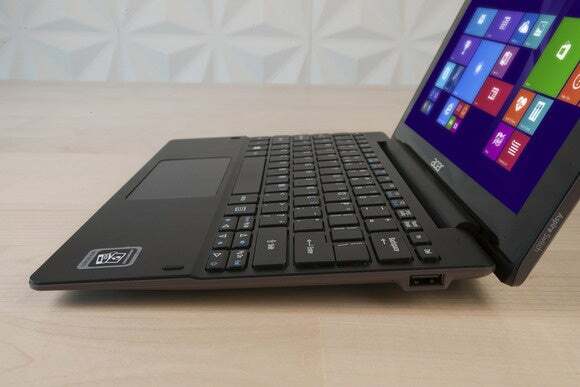 The Aspire E-15 interestingly has a second hard drive in the keyboard section to go with the SSD in the tablet portion. The keyboard is your standard, mushy (cheap) laptop keyboard—with one exception. All the keys are, as far as I can tell, ever-so-slightly concave. Or at least that's what my fingers are telling me, even though the keys look flat. It's a bit weird. The trackpad is a mixed bag. It's more precise than most of the other trackpads in this round-up, which is great. There's nothing more frustrating than fighting against the trackpad when you're trying to move the mouse. But Acer's also following the trend of eschewing physical mouse buttons in favor of clicking the trackpad itself. The E-15's trackpad is loud, and not just when you click—tap-to-click causes the trackpad to quack/rattle in a distinctly unpleasant way. And one more obnoxious choice: The E-15's speakers are on the bottom, towards the front corners. Placing the laptop on any soft surface (like, you know, your lap) immediately muffles and distorts the already-not-great audio, and cuts the volume practically in half. Listen: The Acer Aspire E-15 turned in some perfectly good stats here, as far as $500 laptops are concerned. I say this because there's another prevailing narrative we could focus on instead: The Acer Aspire E-15 basically nips at the Toshiba C55-C's heels the whole time. And for good reason—the internals are almost identical. The E-15 packs an Intel Core i5-5200U clocked at 2.20GHz, Intel HD Graphics 5500, 4GB of RAM, and a 500GB 5400 RPM drive. Compare that to the C55-C's i5-5200U at 2.20GHz, Intel HD Graphics 5500, 8GB of RAM, and a 1TB 5400 RPM drive. Yeah, they're pretty similar. But Toshiba's C55-C just barely edges out a win in almost every single test, thanks to that 8GB of RAM. Thus the E-15 turns in a PCMark 8 Home Conventional score of 2,186 to Toshiba's 2,527, a Creative Conventional score of 2,055 to Toshiba's 2,198, and a Work Conventional score of 2,669 to Toshiba's 2,771. These are marginal differences—and compared to most of the competition, Acer's E-15 is still a strong machine. It took second place in pretty much every single test, so this is no slouch of a laptop. That's almost worse though—it's so close to Toshiba's C55-C but can't quite eke out a win. And considering how similar the two are in terms of build, screens, et cetera…well, there's just not really a compelling reason to take the Acer's slightly worse performance instead of Toshiba's. Though it is worth mentioning that Acer actually eked out a win in our Handbrake test, wherein we have the computer transcode a 30GB MKV file. It took Toshiba's machine seven extra minutes to complete the test than the E-15 (2 hours and 29 minutes versus 2 hours and 22 minutes, respectively). This could potentially be a result of better heat dispersion in Acer's machine, meaning less performance throttling. The Acer Aspire E-15 is packed with of all sorts of software you may or may not want by default, but there's good news: Most of it is from names you'd recognize. Quite a bit of it is Acer's own software. Acer Care Center, Acer Launch Manager, Acer Quick Access, et cetera. These are harmless, if ultimately pointless bits of software. Load up Acer Portal, for instance, and you're confronted with "Build Your Own Cloud: Easily create, personalize, and enjoy your own connected universe across any device or accessory with abApps." Or just don't, and uninstall Acer Portal. Voila. And for third parties, it's mostly recognizable brands—Wildtangent Games (they're still around? ), Hulu Plus, Amazon, Netflix, Flipboard, Evernote, Dropbox, Spotify, and Music Maker Jam. Would I prefer nothing came pre-installed? Sure. But at least this is software you might use, unlike the typical third-party garbage. One note of contention: Like many of the laptops here, Acer opted to include McAfee for your antivirus needs. I do not think McAfee is a good antivirus program—not least because it nags you incessantly while hogging your (already limited) performance. Get something better. Don't get me wrong: The Acer Aspire E-15 is a good machine. It performs better than 80 percent of the pack in this review round-up, it turned in respectable benchmarks, it's solidly constructed, and it has a boatload of storage if that's what you need.